Info "That's MY treasure in the cave!" Crash Prize is one of Wario-Man's microgames in WarioWare: Twisted! The name is a pun on the saying "cash prize". 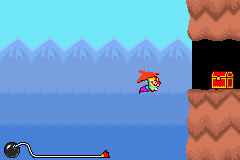 Using the Game Boy Advance's tilt, the player must guide Wario into the cave. Level 1: There are no obstacles. Level 2: A bat comes out of the cave. Level 3: A pterodactyl comes out of the cave.